A seasonal outdoor pool and California's Great America five miles away are some of the winning features of the non-smoking Wild Palms Hotel. The Wild Palms Hotel has a distinctive Mediterranean feel with two scenic courtyards lush tropical landscaping mosaics vivid murals and handcrafted furnishings. The two-story building houses 208 rooms decorated in bungalow style with relaxed colors inspired by ocean coral island spices and seashells. Rooms feature canopy beds mini-fridges and flat-panel TVs with premium cable and some rooms have CD players or iPod docks. Join The Negotiator in his cabana next to the seasonal outdoor pool. The hotel also has a hot tub and a fitness center. 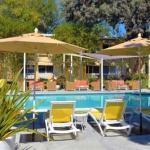 The hotel is near several restaurants one mile southeast of Sunnyvale Arboretum and Sunnyvale Heritage Museum. Yahoo! and Lockheed Martin are both five miles away as is California's Great America theme park. The hotel is seven miles west of San Jose International Airport.